. . . to be the new chair of President Obama’s Council of Economic Advisers. Krueger is a world-class economist who has produced much fascinating, groundbreaking research, and he has ample Washington policy experience. Although Krueger is typically classified as a labor economist, not a macroeconomist, his research is far-ranging and his opinions on macro issues, as expressed in his columns and Economix blog posts for the New York Times, look sensible and well supported. On the other hand (and there has to be an “other hand” — I’m an economist, after all! ), will Obama listen to him? Christina Romer and Austan Goolsbee, Krueger’s predecessors at CEA, gave Obama excellent advice about the need for a strong fiscal stimulus but he ignored it, opting for a stimulus only about half as large as they urged. Neither of them could possibly have agreed with this summer’s bizarre pivot away from jobs toward deficit reduction at a time of 9% unemployment, not to mention the way it opened up the president to Republican debt-default brinkmanship. No wonder Goolsbee was so delighted to leave the job. The usually excellent Ezra Klein was on “The Rachel Maddow Show” tonight, and for once I’d say he got it wrong. He said Krueger’s policy work experience with Larry Summers in the Clinton and Obama administrations and his tennis partnering with Tim Geithner make him just another insider, not a real change. I see no evidence that Krueger is as willing as Summers or Geithner to kowtow to Wall Street interests, and at this point even Summers seems to be calling for a fiscal stimulus instead of short-term deficit reduction. It looks to me like Krueger is cut from similar nuanced-Keynesian cloth as Romer and Goolsbee, but better connected. The CEA chair who plays doubles with Geithner has a better shot of making a difference. Today’s big news is an unexpected surge in consumer spending in July. After adjusting for inflation, the increase is 0.5%, which is the largest since 2009. It comes after three straight months of decreases in real consumer spending and a historically dismal reading for consumer confidence a few weeks ago. Granted, the recent plunge in consumer confidence could translate into an immediate about-face in consumer spending, but for now the picture looks quite different. Much of the collapse in confidence was due to the debt-ceiling fiasco and dashed hopes for a budget deal, but memories of that episode may fade, at least as far as their impact on consumer behavior; after all, Congressional dysfunction is nothing new. The July increases for personal income (0.3%) and consumption (0.8%) pull the year-to-year monthly increases up to 5.3% and 5.1% (in nominal terms). Subtracting the 2.8% inflation over the same period, the real increases are 2.5% and 2.3%. (Source: Bloomberg.com; sorry, no Permalink available.) Still not enough to lead a rapid recovery, as 3% real GDP growth is the norm and at least 4% would be needed to reduce unemployment, but not bad. Dean Baker has noted that consumption is actually fairly high, in the sense that the household savings rate is low by postwar standards. So it appears that consumers are spending, they just don’t have a lot of income to spend. What’s dragging the economy down? The point about investment is particularly notable. All through this Little Depression we’ve been hearing that companies are reluctant to invest, whether because of pessimism about future sales (me, for example) or because of uncertainty about future taxes and regulations (conservatives). A bit less than half of investment is in equipment and software, so it’s good news that that’s largely come back. The larger part of investment, structural investment (both commercial and residential), is still hurting, however; I’d think the reasons are related to the post-2007 woes in the housing and real estate sector in general. The Commerce Department’s quarterly GDP reports are a godsend for trying to pinpoint what areas of the economy are strong and which are week. The reports have three one-page tables: Table 1 gives the annualized real percent change for the various GDP components, broken down into a couple dozen sub-components; Table 2 gives the contribution of each one to real GDP growth (e.g., if increased investment caused GDP growth to be 1.0% instead of 0.0%, its contribution is listed as 1.0%); Table 3 gives the dollar value of each component and sub-component. Yesterday’s report contains revised figures for the second quarter of this year, and quarterly figures dating back to 2007. What do they tell us? First, looking at the yearly figures, in 2008 and 2009, the two years when real GDP actually fell, investment fell even more sharply, and consumption fell somewhat, with positive contributions from net exports and (secondarily) government purchases making up some of the difference. Okay, that’s not news, but it’s worth keeping in mind. 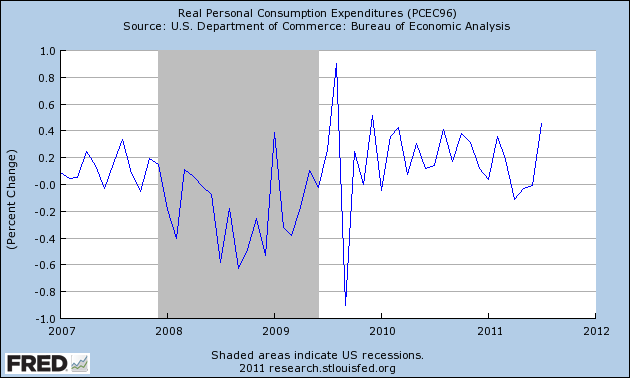 What caused growth to be so slow in the first two quarters of 2011? Government retrenchment led the way, with respective contributions of -1.23% and -0.18%. In the first quarter, most of the retrenchment was at the federal level (-0.81%), which probably represents the winding down of the stimulus. In the second quarter, state and local government retrenchment shaved 0.34% off GDP, while the federal contribution was slightly positive. Also in the first quarter, a surge in imports mostly negated the contribution of increased consumption (1.47%-1.35%). Not bad, but too small in relation to the economy to lead economic growth. Investment in structures was still poor (with a combined contribution to GDP growth in the two quarters of about zero), and rising imports more than offset the improvement in exports. Perhaps the key thing that sticks out is that even without the drags on the economy from government retrenchment and negative net exports, the positive parts of the economy were themselves fairly weak. Consumption contributed just 1.47% and 0.30% respectively; investment just 0.47% and 0.78%. Even without the drags from government and net exports, that’s total growth of just 1.94% and 1.08%. This is still a very slowly recovering economy, still a Little Depression. It also looks like there’s way too much vacant housing and physical plant out there for many people to want to build. The great Keynesian hope: Republicans? ‘… how about a new stimulus package focused on granting Republicans’ requests for public investments? If Obama wants to make this idea more responsible, he could say he’ll do this only for requests that are also on the American Society of Civil Engineers‘ extensive list of needed infrastructure improvements. It may be the best hope for a new spending stimulus. (A tax-cut stimulus might be easier to get through Congress, but standard economic impact estimates find that tax cuts do less to increase GDP than new spending does. And the type of tax cuts that Republicans tend to favor, like lowering the top marginal tax rate and reducing the capital gains tax rate, do even less, because wealthy people don’t consume much of their extra income.) If Republicans reject it, they’ll look hypocritical for wanting one thing for their districts and another for the nation. Another Kabuki dance has commenced in Washington, now that Congressional leaders of both parties have made their selections for the Gang of Twelve charged with crafting $1.5 trillion in savings in 2013-2022. They have until Nov. 23 to agree on a package of savings. If Congress can’t pass that package, then $1.2 billion of automatic, across-the-board spending cuts (no tax increases) would kick in. 1. Negotiations among the twelve constantly are on the verge of breaking down along party lines, especially on the issue of tax increases. Possibly they are unable to reach a compromise at all. Even if they do, few of them will throw much weight behind it. 2. If a budget plan emerges, getting majority support in the House and 60 votes (or 51 votes, if nobody filibusters it) in the Senate will prove impossible. The partisan acrimony will look like open warfare. 3. With the specter of $1.2 trillion in across-the-board cuts, including maybe $500 billion in Pentagon cuts, the Secretaries of Defense, Homeland Security, and other agencies, joined by citizens and interest groups all over the nation, will howl that these cuts would devastate our country. Congress’s approval rating will plummet even further, to about the same level as the Taliban’s. 4. Congress will pass a new bill that says, um, nevermind about all those spending cuts. (This is an inherent problem in trying to tell future Congresses what to do, or even telling oneself what to do a little ways down the road.) Republicans will continue to pummel Obama and the Democrats for overspending, but neither side will be able to push a new deficit-reduction plan through both houses of Congress. Now, what about the reaction of the markets to all this? I think that most of the market already expects something like this and has basically priced it in. It’s decades-old news that Congress has no stomach for long-term deficit reduction, and obvious by now that the partisan split in this Congress is among the worst ever. If the above predictions come to pass, then the markets and economy will get worse, as this failure becomes definite. As I’ve written before, I think the market is reacting less to the U.S. debt burden than to continued evidence that U.S. politicians are simply not doing their job when it comes to dealing with the Little Depression. I think they’re appalled that Congress and the White House are wasting so much time on this doomed debt deal and have basically painted themselves into a corner with this Nov. 23 deadline and automatic-spending-cuts mechanism. They see the writing on the wall; either Obama, Boehner, Reid, et al. don’t or each side is cynically thinking that they can spin this fiasco-in-waiting to their advantage. Either way, they’re not doing their job. They’ve set themselves up to fall, each side hoping that the other falls further.